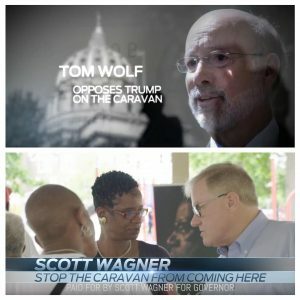 Today, GOP candidate for Governor, Scott Wagner released his final television ad before the election championing President Donald Trump’s call to send troops to the southern border of the U.S. to prevent a migrant caravan of entering the country. The 30 second spot also attempts to paint Wolf as not keeping Pennsylvanians safe. This ad is a part of the $1 million the Wagner campaign is spending on television in the final week of the campaign. The Wolf campaign believes the ad is a “race-baiting” attack that shows their opponent is not fit to be Governor. In recent weeks, Trump has used this developing story of the migrant caravan to rally his base, while portraying the Democrats as not keeping the country safe. Yesterday, Trump shared an ad on his Twitter account that garnered national attention detailing his administration’s differences with the Democrats on the migrant caravan. Stop the welfare and free schools, free medical care and see how quickly the caravan turns around. Let Mexico take care of these people. Stop foreign aid if they dont. I am voting for Wagner. One of the few. One of the proud! Still laughing that Wagner thinks the people of PA are going to kick out Wolf over the caravan of unfortunate people 2500 miles away. I needed the laugh. Thank you Scott. Yep, because most people from PA are obsessed with a bunch of unfortunate people 2500 miles away who pose absolutely zero threat to us. The perfect way for Wagner to end one of the worst campaigns in the history of PA. Wagner makes Lynn Swann look like a political genius. Remember when Woodrow Wilson threatened to station 10,000 troops at Ellis Island to keep the Italians and Irish out of the U.S.? Me neither. Well that’s just nasty. And unfortunate. Oh well. Congratulations on the impending reelection Gov Wolf!! This “caravan” is a group of impoverished refugees so terrified to remain in their home countries that they are walking 1,000+ miles thru hostile territory populated with bandits and rapists itching to prey on them, safe only to the extent that the group can watch each other’s backs. Their great sin is in believing the myth of this country: that we give people a chance to build new lives through hard work and responsible behavior. Trump denies them even the chance to have a conversation as to wether they can apply for asylum; instead, today he says that, if they so much as throw a rock, our military will shoot them. Isn’t there enough here to be ashamed of, without Wagner piling on? I cannot wait for Nov. 7, when he can go back under whatever rock he crawled out from. Garbage Man, indeed. Wagner has run a catastrophically bad campaign that never got off the ground and was searching for meaning during it’s brief existence. It was a campaign seeking it’s own purpose. Issues were grabbed onto with dear life whether it be sanctuary cities of wandering caravans coming to Pennsylvania. The root cause always goes to the top which is the candidate. Jumping into politics as a write-in and winning a State Senate seat gave Wagner the wrong impression as to his political skills (he has minimal amounts). In the final analysis, lacking political experience caused lesser political skills which resulted in being behind 26 points. It is very hard to get that far behind and shows no inroads at all happened.